Hello everyone hope you had a good weekend, to tell you the truth I had a really lazy one as it was raining and very cold so (laying on the sofa with my favourite blanket and watching movies was my first option) 🙂 In fact this recipe is perfect for when you want to cook something quick, delicious and have basic ingredients. 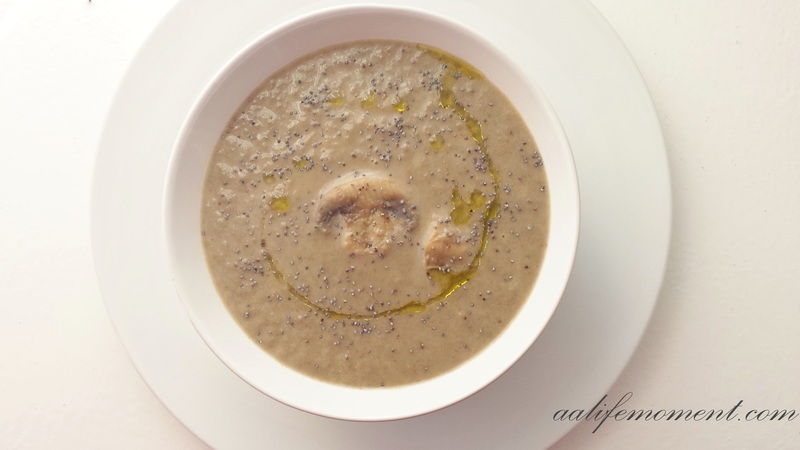 This creamy mushroom soup is one of those treats which is healthy (as there is no cream or butter) and you can really feel the nutty mushroom flavour enhanced by the leek and the herbs and to make it even more special I drizzled some truffle oil on the top. First of all chop the leek, the mushrooms and place them on a medium size sauce pan after that, add the corn starch, salt, paprika and the fresh dill. Then add 2 tablespoons of olive oil and cook on a medium heat mixing everything together so that the corn starch is completely incorporated with the other ingredients for about 3-5 minutes. Afterwards add the water and let it boil for about 20 minutes until all the ingredients are cooked. Then let the soup cool for 5 minutes and then blend it with your blender, after that taste for the salt and then add the milk. Mix again, cook it for about 5 more minutes and you are done. I sprinkled some poppy seeds on the top and to make it really special I added some drops of the truffle oil which I think elevates the mushrooms flavour and brings it to another level but you can use simple olive oil or your favourite herbs or seeds. 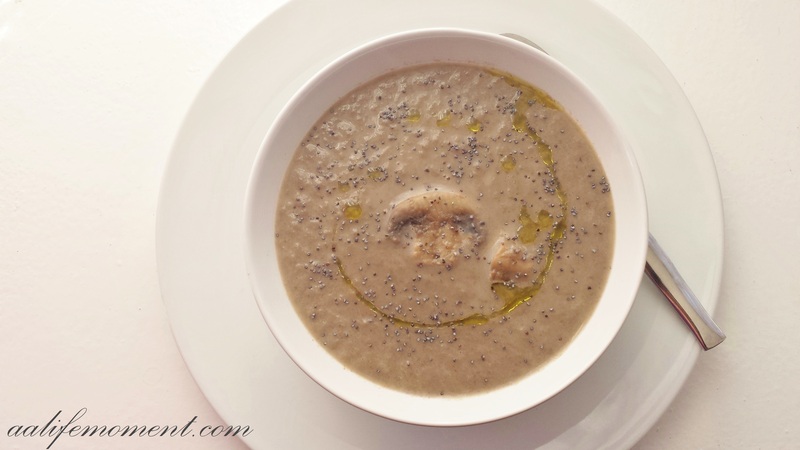 I really hope you will like this creamy mushroom soup recipe. I really like it because it is easy, quick and very healthy. I find that the usage of cream and butter it is pointless as you could lose the real mushroom flavour and aroma. See you at the next recipe! a perfect dish for all this cold weather we’re experiencing here in VA!!! Yes Kat it is half a glass, I used it just to give it a creamy and a delicate kick. Thank you sooo much for stopping by and I really hope you will like the results! Mmm. Mushrooms are my absolute favorite, and this soups sounds like it highlights the flavors so well. It looks like a great, earthy option for the cooler weather. Thank you so much A Famished Foodie you are very kind as always! I am a big fan of simple and few ingredients recipes in this case I think the mushroom has a very delicate flavour so there is no point of adding cream or even butter as this way you could lose the real mushroom flavour. 🙂 Please do give it a go I would love to hear from you the results! truffle oils is absolutely delicious… good choice! Yumm! I’m making this soup very soon, I love anything with mushrooms and it’s quite cold in Mexico too. This sounds amazing. I must try! 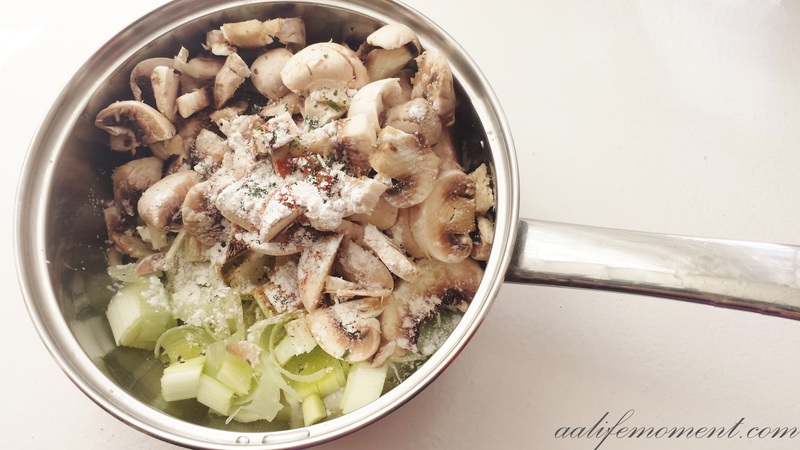 I love mushrooms and this soup looks yummy! I have a very similar recipe but i don’t add leaks, which is actually a really good idea. I add half flour half cornstarch but after i first seize my mushrooms (and onions for me). Is there any difference between putting it before the first phase or the second? I dread truffle, as I found the taste to be too powerful and to swallow the fader taste of Paris Mushrooms. Am I wrong with that? Aww Sandy you are very kind, I am so happy you want to try it. 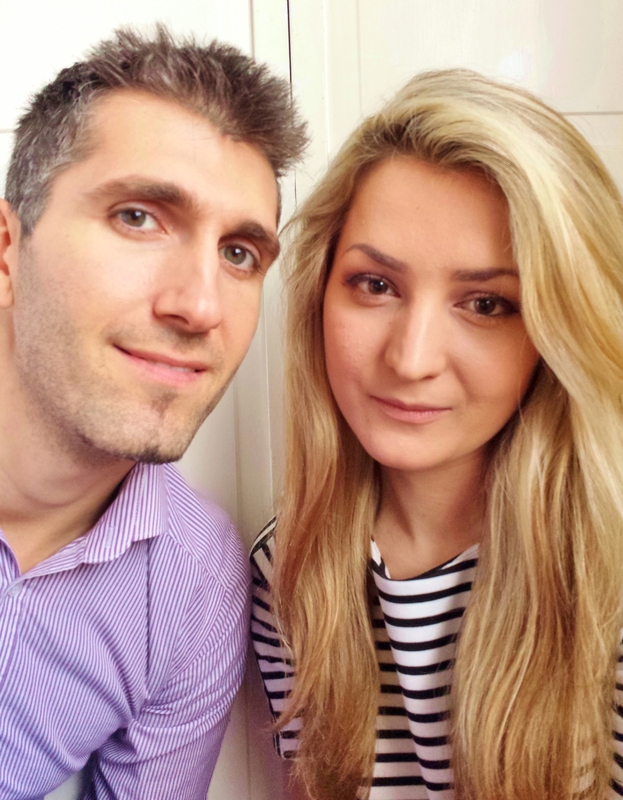 The soup is delicious and if you try it please let me know what do you think!